OAKLAND, Calif. -- Doug Fister didn't have much margin for error, not with Houston managing only two hits - none after the third inning. That turned out to be all the right-hander needed to end his three-game losing streak. Fister pitched effectively into the seventh inning, Jose Altuve homered leading off a game for the fourth time this season and the Astros beat the Oakland Athletics 2-1 Sunday to avoid a series sweep. "Without a doubt that was his best stuff, best aggressiveness and strike-throwing," Houston manager A.J. Hinch said. "I think he got a little tired at the end, but all in all a solid outing on a day we really needed it." 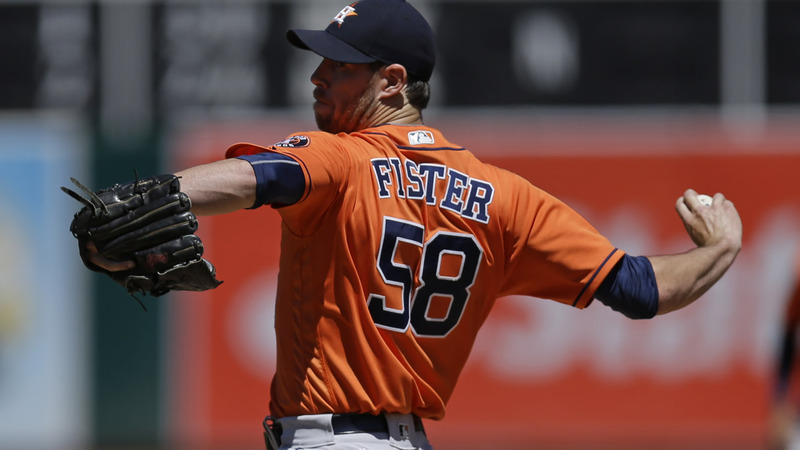 The Astros had dropped nine of 11 and were facing big question marks about their rotation before Fister's best outing of the season. Fister (2-3) gave up one run over 6 2/3 innings, struck out five and pitched out of a pair of early jams to win in his first start at the Coliseum in nearly two years. "We've been working on some things, mentality and mechanics-wise," Fister said. "We see the light for us as a team. It was a productive day and gets us on track to get back home and a happy flight." Altuve hit his seventh home run of the season on a 1-1 pitch from starter Rich Hill after going hitless in the first two games of this series between AL West rivals. Jason Castro singled and scored on Colby Rasmus' sacrifice fly in the third for Houston, which finished 2-4 on its road trip. Marcus Semien drove in Oakland's run with a single in the seventh. "We had some opportunities if someone gets a big hit," A's manager Bob Melvin said. "When you've only given up two runs and two hits, then you have an opportunity to get back in the game. We just weren't able to do it." Tony Sipp, Will Harris and Luke Gregerson completed the eight-hitter for Houston. Gregerson pitched the ninth for his fifth save. Houston needed the strong pitching after squandering numerous chances at the plate. The Astros left the bases loaded in the third, stranded a runner at second in the fourth and then hit into a double play to end the seventh following a one-out walk to Castro. The A's also struggled with runners in scoring position. Oakland loaded the bases in the second but failed to score and stranded runners at third after that, including in the seventh when Jed Lowrie flied out to end the inning. Hill (3-3) fought command issues all afternoon after entering the day fourth in the AL with 37 strikeouts. Oakland's left-hander pitched six innings, gave up both Houston runs and walked four.